While lots of attention has been focused on the City’s recent decision to purchase the Arbutus Corridor lands from CP Rail, other smaller moves to create greenspace are also taking place. 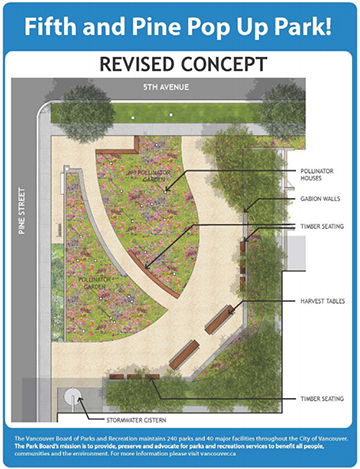 Earlier this month, for example, Park Board Commissioners approved the creation of a “pop up park” at the corner of Pine Street in the 1600 block of West 5th Ave. This is great news for a couple of reasons. This small (0.3 acre/1.3 hectare) greenspace is intended to be a place-holder of sorts. It’s located in the same block as the recently completed park at West 6th Ave and Fir Street. The majority of the properties within this block have actually been acquired to develop a larger neighbourhood park , but rather than wait for this larger acquisition + design + development process to be completed, the Park Board has opted to create an interim space on the site. This means residents and visitors can take advantage of the area now, rather than wait until 2019-2022 when the larger park is scheduled to be built. Perhaps more significantly, it’s the first such park that the City has created in this fashion, and suggests the possibility of opening-up other city-owned spaces, to temporary, community-serving public space uses. (To date, the only other green spaces that have created with this sort of temporary quality are privately owned – such as the community garden and Burrard and Davie. While important in their own right, these are specifically interim spaces that will be (and in some case already have been) redeveloped into residential developments. The Park Board site is a “park before a park” – and what’s especially pleasing about this is that it affirms the idea that interim placemaking ventures can – and should – play a useful role in city-building, while the background work for bigger, more permanent public space creation takes shape. In other words, this approach shows that you don’t have to wait until all the pieces – land, resources, designs – have been gathered in order to do something beneficial. That begs an interesting question – how many other city-owned tracks of land could potentially qualify for something similar? And is there a way to further engage the community in these sorts of temporary placemaking activities?